Combine wheat flour, salt and oil. Gently knead the dough by adding water slowly. Knead till you get soft and elastic dough. Leave the dough by covering with a kitchen towel for 15-20 minutes. Knead again for 5-6 minutes before you start dividing the dough into equal small portions. Dust them with flour and set aside. Now take one small dough ball and roll into a small circle/triangle/square (whatever you are comfortable of). Brush a drop of oil and fold the corners into inside (as shown in the picture below). Repeat the same process to all the dough balls and set aside. Now dust the rolling pin and the surface with the flour and start rolling out roti’s one by one. Concentrate on the edges to get even rolled and flat roti. Keep applying plain flour in between to prevent it from sticking on to the roller pin. Heat pan or tava and wipe it clean with kitchen towel. 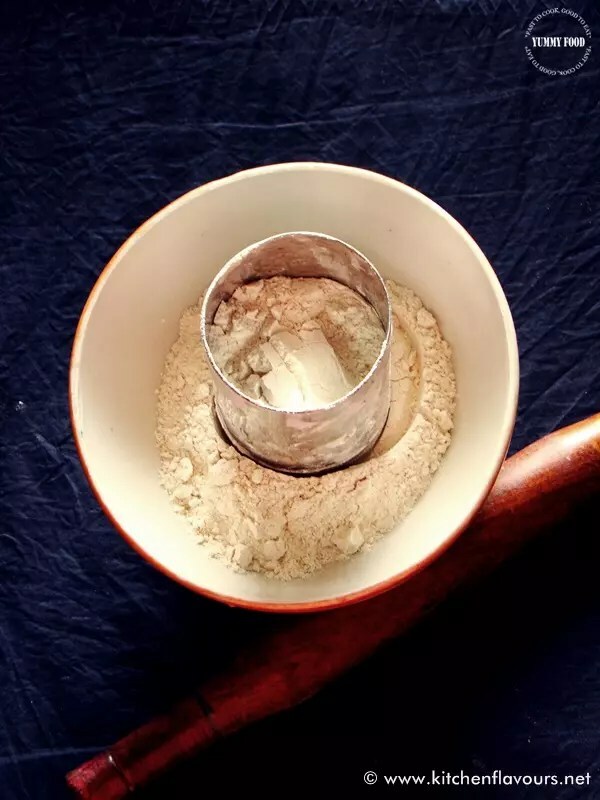 Place the rolled chapati/roti on it and cook for a minute until the top looks dry then turn it over and cook on the other side till small bubbles appear and chapati starts to puff. Use flat ladle/kitchen towel to press roti gently while cooking the other side, to get roti’s puffed. 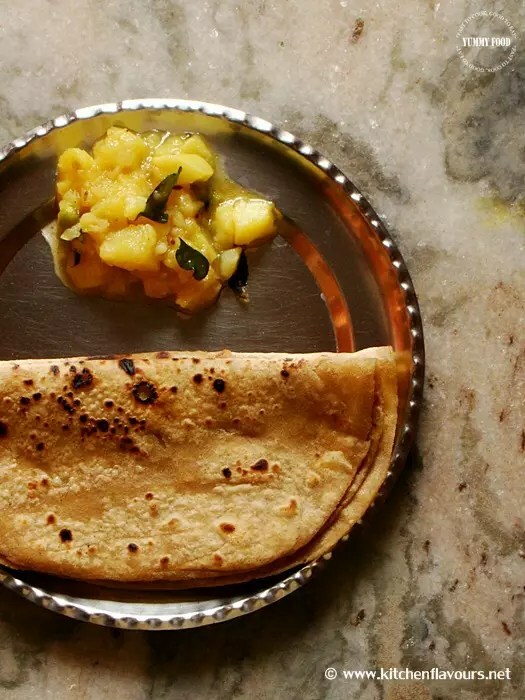 Brush the chapati/roti with oil/ghee on either side and take out on a clean kitchen towel and store in a hot casserole or serve hot with your choice of curry or dal. I served hot roti’s with simple aloo ki sabzi. You can check out various curries and dal recipes which you can serve along with roti’s in the recipe list of kitchen flavours menu @ Curries/Gravies/Sidedishes. Now start rolling perfectly soft and thin roti’s….. Excellent presentation.Very helpful.I fold the rotis into triangles. BTW, congrats to AR Rahman on his recent oscar wins. India must be very proud of him….and I knew Slumdog Millionaire would win the oscars….loved the movie…can’t wait for the DVD!!! Yummy Roti dear…i love all kinds of rotis and parathas..
Love the layered roti, there are so many ways to fold that roti, it’s amazing! Nice step by step instructions(with pictures), kool! love soft rotis..Nice step by step photos.. I wish i could eat this now for dinner.. I love roti! At a time a made these faltbreads a lot… Yours look delicious! Nice presentation…step wise is always helpful…good job. gr8 info..its good that you have given step by step pics..
Nice step by step illustration of making roti,I really appreciate it..nice blog will keep visiting.Hey I also have my cooking blog,pls have a look and do leave a comment if u like it. colorful pictures and yummy roti! The roti looks so inviting…love the close up. Delicious Rotis! Me…learnt a new way of folding the dough! wow, mouth-watering roti! Perfectly made! Would love to have that plate of roti with curry and curd! Good one Lubna,this one will surely help bachelors/new cooks. nice pics describing each step. roti looks so soft. Very good presentation! Love this roti! Thanks for visiting my site! Such delightful “how to” pictures! Those rotis look so flavorful, I am looking at the yummy spots where the heat cooked them so perfectly( the little brown spots I love those. I am sure everyone out there love your tutorial!! I appreciate it! Nice idea to make rotis… thanks for step-wise pictures! Thank you Varunavi, Madhumathi, VG, Veena, Asha, Malar, Ashwini, Lavi, Sunshinemom, Rosa, Rekha, Deepa, Preety, Mikky, welcome, Cham, Simply Spices, Food Fanatic, Anu Sriram, Uma, Soma, Nithya, Mahimaa, Smitha, Madhu, Pooja, Nazarina and Suma. India is always proud of its fellow citizens VG. Thank you for the wishes. beautiful presentation…I fold it twice to a triangle..this is different ..lovely picture..
Gosh this looks amazing and you mapped it out for us readers.. all the more fabulous! looks yummy and beautiful step by step presentation! Heh it’s my weekend breakfast dish! Love this with dhal and in Malaysia we call it roti canai whilst in Singapore we call it roti prata. Luv the step by step instructions you have shown for folding..Roti looks very yummy..
Wow..you have such a lovely blog, full of recipes I would like to try. Thank you for sharing.. look forward to visiting often. Thanks for the tutorial, I have made chapatis before but didn’t know to do the fold before rolling – yours look delicious. Is this the same kind of bread used in thosai/dosa? I love naan bread too! The Roti looks delicious. I love rotis than more than rice for meals. Thank you Sowmya, Vidhya, Girl Japan, Akal, Retno, Priyanka, Ysmeen, Jo, Paru, Sketched Soul, Divya, Nataysha, Tigerfish, Neema and Mona. Oh nice to see you back Divya. No it is different Tigerfish. looks yummy & nice presentation..
wow..that was nice post,.,step by step…it really helps the beginners..
Wow…Nice step by step explanation!!!! This is one of the Indian recipes I have been wanting to make for a long time now. Your roti looks beautiful. excellent photo tutorial! Roti chala perfect gaa vachindi. My dear friend ~ a surprise awaits you at MY BLOG. Thank you Shama, Srikar, Homecooked, Anjum, Ashwini, Ivy, Vani and Andhra flavors. Iam on my way dear VG. Excellent step by step presentation. Hey nice illustration of roti making! Very useful! Thanks for visiting my blog.ur blog is very nice! Thank you Ana and Saranyas. wow!the bread looks good.I will try this recipe.Thanks for the tips. Thank you Meeso and sweetiepie. Wow, you went through a lot of trouble to write this post with all of its steps and directions! I always wondered how they made those roti wraps. It looks similar to Mexican burritos, but the taste is so much different.